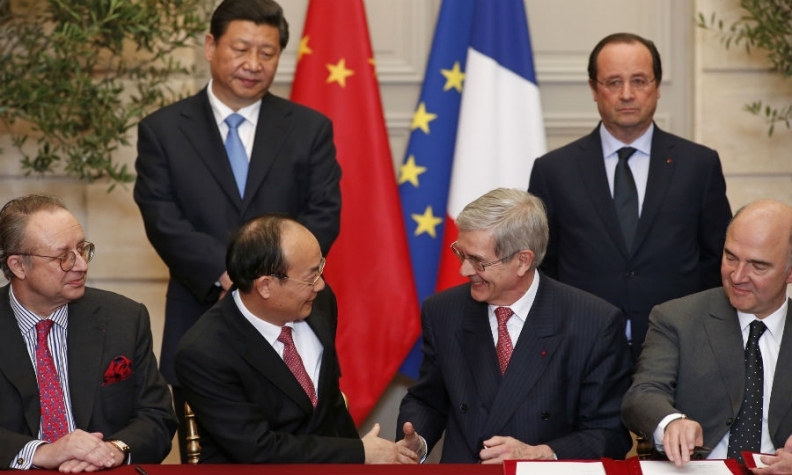 China's President Xi Jinping (back row left) and French President Francois Hollande (back row right) look on as PSA CEO Phillippe Varin (second right) shakes hands with Dongfeng Chairman Xu Ping (second left ), watched by Robert Peugeot (left) and French Finance Minister Pierre Moscovici (right). PARIS (Reuters) -- PSA/Peugeot-Citroen has signed a tie-up with China's Dongfeng Motor, bringing the French carmaker much-needed cash and greater access to Asia but leaving major challenges ahead. French President Francois Hollande and visiting Chinese counterpart, Xi Jinping, oversaw the signing on Wednesday of a framework deal for state-owned Dongfeng Motor Group and the French government to take matching 14 percent PSA stakes in a 3 billion euro ($4.1 billion) capital increase. After the signing ceremony President Hollande said that deal makes PSA a carmaker of global dimensions that can be present on all markets. "This is no longer just about selling, it's about investing together," he said. The tie-up allows PSA and Dongfeng to extend their existing Chinese joint venture to co-develop vehicles, ramp up production to grab a bigger share of the world's largest auto market and export their cars around Asia. New PSA CEO Carlos Tavares must now turn around unprofitable European operations, halt persistent Latin American losses, deliver on China plans that many consider ambitious and treat a Russian headache that may be about to worsen. Tavares, former chief operating officer at rival French carmaker Renault takes over as CEO next week, with Thierry Peugeot bowing out as chairman in a deal that had pitched him into public conflict with cousin Robert over the dilution of the family's stake and loss of control. "When you pass major milestones it's normal that there be discussions and differing opinions," Robert Peugeot, who heads the family's holding company FFP, said in a radio interview. "But when the day comes for decisions, they are taken unanimously." With losses mounting almost everywhere else, PSA has high hopes for China, pledging a near-trebling of sales with Dongfeng to 1.5 million vehicles in 2020. In a second Chinese venture with Changan, PSA expects to sell out its annual production capacity of 200,000 upscale DS vehicles by 2016, a spokesman said as the company prepares to roll out a new DS5 LS mid-sized sedan. "We don't doubt PSA's ability to capture additional share in a Chinese premium market that is growing very strongly but caution against too much optimism," Erich Hauser, of International Strategy and Investment, said in a note. Meeting the company's goal of a 10 percent share of the premium market would require its network of 56 Chinese DS dealers to expand at an unlikely rate and match the 2012 sales of Mercedes-Benz through 262 outlets, the London-based analyst said. "With only 3,500 unit sales in China in 2013 there is nowhere near as much brand awareness for DS," Hauser said. While PSA gave no geographical breakdown of last year's 2.32 billion euro loss, the carmaker has confirmed it is losing money in Latin America and Russia. Tavares faces a long haul to restore profitability to plants in both regions, in part by reducing a heavy dependence on imported components that has left PSA critically exposed to a recent currency slide in emerging markets. PSA's sales tumbled 16 percent in Brazil last year and 19 percent in Russia, with its outlook vulnerable to a weaker ruble and possible trade sanctions over the country's military incursion into Ukraine. While rival Renault buys 80 percent of Russian parts locally, PSA is 70 percent import-dependent at the Kaluga plant it shares with Mitsubishi. UBS analyst Philippe Houchois, said PSA is small in Russia and has the wrong product. He predicts that its losses in the country may be worsened by the ruble's weakness. In the saturated European market, which still accounts for 58 percent of the company's sales, PSA registrations have begun to bounce back after a six-year slump, rising 5.1 percent in the first two months of 2014. PSA closed its Aulnay plant near Paris last year and may need to pursue more cost savings beyond the current recovery plan, Tavares said this month. Pressed during his Europe1 radio interview on the possibility of further cuts, Robert Peugeot said on Wednesday that factory closures are "not currently part of the plan."